Since receiving a bag of Macadamia Nuts from Oh! Nuts last month, I’ve been having a blast using them in recipes. In the past, I haven’t often cooked with macadamia nuts. Being a southerner, pecans are always my go to nut. But I’ve found macadamia nuts to be very versatile in the kitchen and I absolutely love their crunch and mild but buttery flavor. The macadamia nuts from Oh! Nuts are much fresher and better in quality than the ones that are available at my local grocery store. So far I’ve used the macadamia nuts in muffins, pancakes, salads, and now as a coating for chicken tenders. 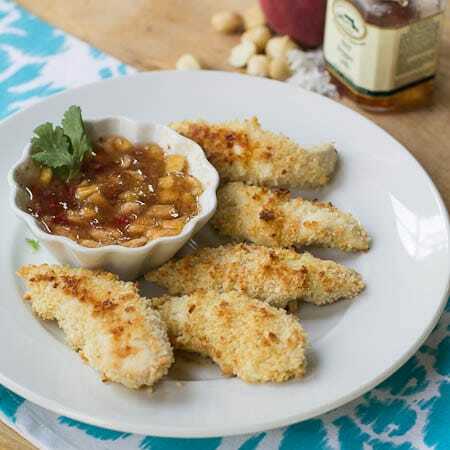 These chicken tenders are baked, not fried, but the nutty, coconut crust will satisfy any cravings you have for fried foods. Macadamia nuts and coconut are the perfect pair, and great for summertime since they have a tropical flair. Pair with a peachy pepper jelly sauce that is both sweet and a little spicy for a delicious summertime meal. Preheat oven to 375º and spray a baking sheet with cooking spray. Place macadamia nuts and coconut in a food processor and process until finely ground. Add panko crumbs and give the mixture a quick whirl to mix the panko in. Pour onto a plate. Place flour on a separate plate. Mix together egg and milk in a bowl. Sprinkle chicken with salt and pepper. Coat lightly in flour, dip in egg mixture, and then roll in coconut mixture. Place on baking sheet and spray chicken with cooking spray. Bake for 15 minutes or until no longer pink in center. In a small saucepan, combine pepper jelly, peaches, mustard, and horseradish. Bring to a simmer for 5 minutes. Let cool to room temperature. 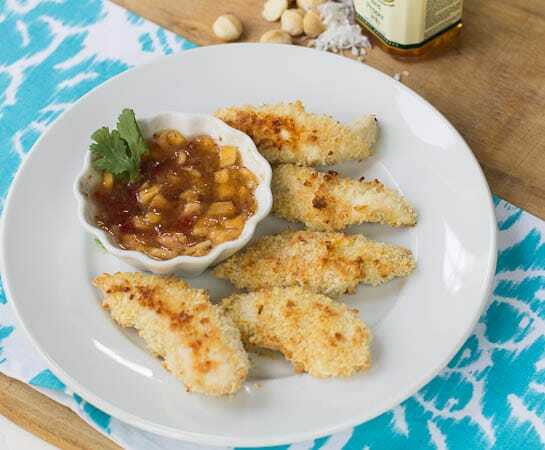 This entry was posted in Main Dishes and tagged chicken, coconut, macadamia nuts, Oh! Nuts, peaches, pepper jelly, poultry. Bookmark the permalink. I have a coconut chicken recipe that I make all the time (it’s actually on the menu for dinner tonight) but I think I need to try using macadamia nuts too! And I have some leftover from another recipe. Perfect timing! WANT! I love macadamia nuts. Macadamia Nuts are fabulous aren’t they? I love macadamia nuts! They have such a great tropical flavor and pair perfectly with coconut. 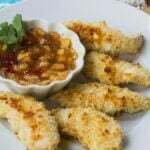 These coconut macademia crusted chicken tenders llok so good! Oh yum! 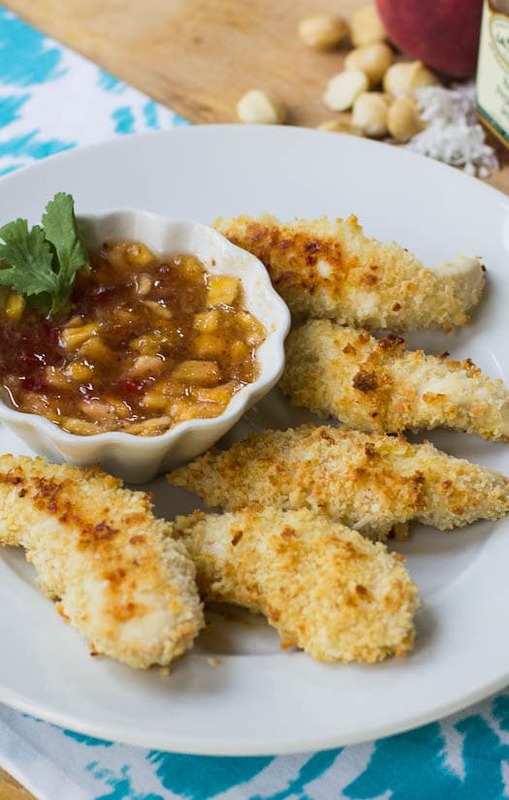 I’m a huge fan of coconut shrimp, so I bet these are amazing. I love chicken too, so putting them together is brilliant! 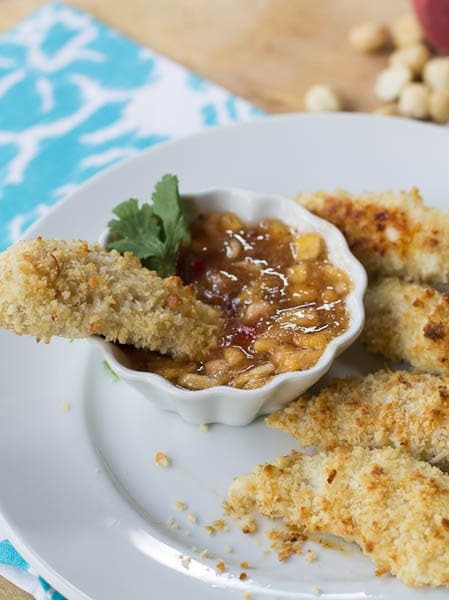 I love the idea of using macadamia nuts in bread crumbs! Looks yummy! Ummm, what?? I’ll be right over. Growing up in the south with pecan trees in our yard, the pecan is the first nut I think of for recipes but your combination of coconut and macadamia nuts sounds wonderful in this dish. Southerners do love their pecans! 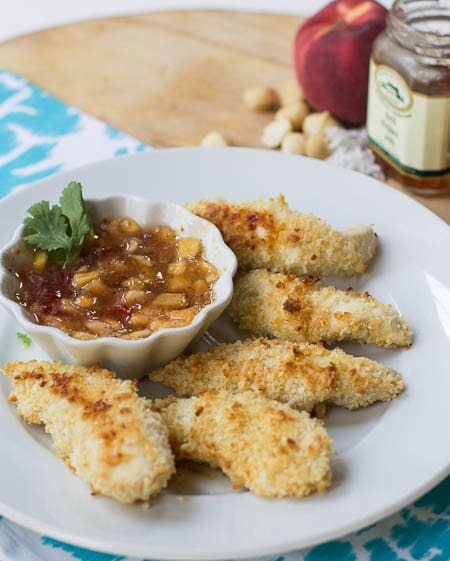 I love coconut crusted chicken and the addition of macadamia nuts sounds delicious. I’m also intrigued by your peachy pepper jelly sauce, did you make it yourself? Ashley- I semi-made the peach pepper jelly by adding peaches, mustard, and horseradish to an already prepared pepper jelly. I love using macadamia nuts in cooking. Especially when I make macadamia nut crusted fish. 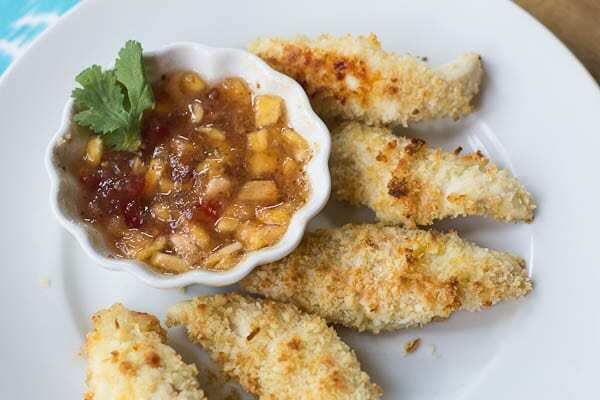 These chicken tenders paired with a peachy pepper jelly sauce look truly delicious and very appropriate for the Summer! Thanks Julia! I’m going to have to try some macadamia nut crusted fish next. You always have the best seafood recipes.